Modern joint replacements are expected to have a long working life. An artificial joint is a mechanical device and like any all mechanical devises they can wear out. The best implants have less than one in twenty failing after 10 years of use. A revision knee replacement is a larger more complicated procedure than the first replacement. The same risks are present as for primary replacement but they are increased. Recovery is likely to be slower than for primary surgery with a slightly longer hospital stay. The old knee replacement is removed and a larger revision implant is put in place. This is the biggest concern of most patients having a knee replacement. Modern techniques will allow better pain control and a more rapid recovery. Analgesia is started before surgery. Local anaesthetic is injected into the knee and regular pain relief is given following surgery with extra analgesia available if this is not sufficient. A revision knee replacement will not be pain-free but it can be a tolerable procedure. Mobilisation starts in recovery. Patients are encouraged to lift their legs up and to start to bend the knee when they leave the operating theatre. Patients do not usually have clips or sutures to remove. They will have a tight dressing from the toes to the thigh, which supports the knee and improves pain control. 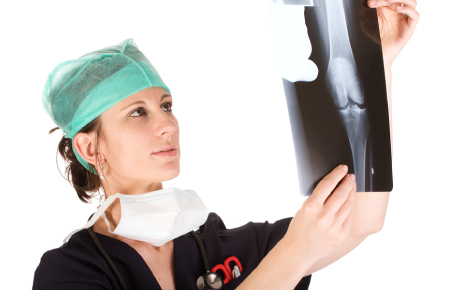 A knee replacement is generally a safe surgical procedure. For most people, the benefits in terms of improved mobility and less discomfort, are greater than the disadvantages. However, all surgery carries an element of risk. This can be divided into the risk of side-effects and the risk of complications. These are the unwanted but mostly temporary effects of a successful procedure. After surgery, your knee is likely to be swollen and sore to move for up to three months. The skin over the knee and scar are likely to feel numb. Sometimes this is permanent. Your bowels may take a while to return to normal. You may have difficulty passing urine on the first day or so. A catheter (a thin tube) may be inserted into the bladder to help urine flow. This is when problems occur during or after the operation. Most people will not be affected. The main possible complications of any surgery include an unexpected reaction to the anaesthesia or excessive bleeding during or soon after surgery. A blood transfusion may be required to replace excess blood loss. The chance of complications depends on the exact procedure you are having and other factors such as your general health. You should ask your surgeon to explain how these risks apply to you.